A couple of months ago, my little sister, Kristen, left a comment on Crunchy Shrimp Roll requesting a roll with bacon, green onion, avocado and mozzarella cheese. So a week or two ago, I had all the ingredients so I decided to try it. It is really good! (Of course, any roll with bacon is good 😉 ) I’m sure she’s going to be mad at me because I didn’t go home and make it for her (don’t worry, I will eventually… if you are lucky it might even be before you leave!) 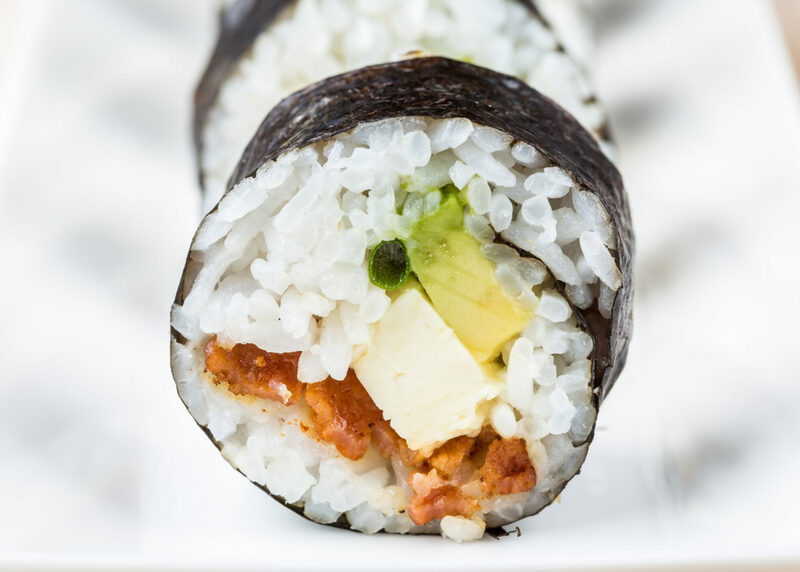 😀 Anyways, this roll is really good… definitely one you could use to introduce non-sushi eaters to the concept of different ingredients rolled up in sumeshi and nori! Fry bacon to the crispiness you prefer. Remove white bulbs fron green onion stalks. Wash green onion. Cut avocado in half, discard pit and skin. Slice into thin sticks. Roll the sushi, using a slice of bacon, a stalk of green onion, several slices of avocado and half of a string cheese as your fillings. Serve with wasabi and shoyu. Enjoy! And yea…why didn’t you come home and make this? BTW, small thing, maybe it’s me. I’ve been experiencing a small glitch on your site lately. When I go to comment, your pictures will suddenly open up, blotting out my comment, though I can still type. I usually browse your photos before commenting, if that makes a difference. Any help? Am I doing something wrong here? Sushihound – Hehe yeah, it works pretty well! Yvo – Hehe sorry! When I first read your comment, I was like, closing time? Noon? Oh wait… you’re in NY – 3 hours later for you hehe. About the glitch… what browser are you using? It could have something to do with that… plus if we know what browser the glitch is on, we can try to fix it! I suggest making a vegetarian version of this one and calling it Darren Maki! Eh? Allison- I’m using IE 6…. And just now, I didn’t click on your pictures and am not experiencing the picture/glitch. Um… also, it’s 11:54 am EST right now… weird. Your bacon looks so tasty! I think Darren is just jealous of me…and I have more ideas! Don’t belittle me on the internet. I’d much rather you do it in person. Kristen – Haha probably. 😛 Hmmm that sounds good… I could definitely try it sometime and see how it works. I assume you would eat up the gouda and brown rice and tomato that I don’t use up in the sushi, so I might do that sometime at home, maybe before you leave. If you go get the ingredients, I’ll make it when I make the rest of the sushi…! On what budget of mine do you propose I purchase these things? Great idea, Kristen! I must try this one someday…maybe after a hip hop class in the summer?